Welcome to the 'ville. Perhaps if your daughter uses a larger hook it won't be so tight. from ST. LOUIS !!! I was born in Boonville, Missouri but my parents moved to St. Louis when I was small. Welcome to Crochetville!! Love your dragon!! Hey sorry I haven't replied back to ya. Been busy for the past week. Thoughh here is your official to the forum from me. Great Job on the Dragon. I must give this one a try as my youngest son collects dragons and wizards. My eldest son learnt to do some basic crochet when he was in primary in the school's "interest afternoons" while the youngest did a little knitting. Of course they are teenagers now and don't want to know. At the time they made items coloured to match their local Sydney Football teams. Hi and welcome. If you haven't found it already http://www.crochetpatterncentral.com has tons of free patterns although they don't have a section marked "Manly" or "Tough" LOL. Also http://www.freepatterns.com has a lot of stuff. That one you have to register for, but it's free. Welcome. My husband knits, and finds it very relaxing. I tried to teach him crochting, but he just can't get the hang of it. Great job on your daughters dragon. Greetings from Illinois. The dragon was great. Your daughter is a lucky girl. :welcome:mdust from a fellow crochet lover in MI! It's always nice to see a new face. I'm glad you've decided to join us! There's always a new pattern to try or a conversation to jump into around here and everyone is so helpful! They're a great bunch! :bheart I hope you enjoy your time here at the 'ville as much as I have. I've been crocheting like crazy for about six months now. I am also self-taught. I think it's so cool that you've learned so that you can teach your daughter! What a great craft for the two of you to do together. I look forward to seeing your work in the show-and-tell folders and getting to know you! 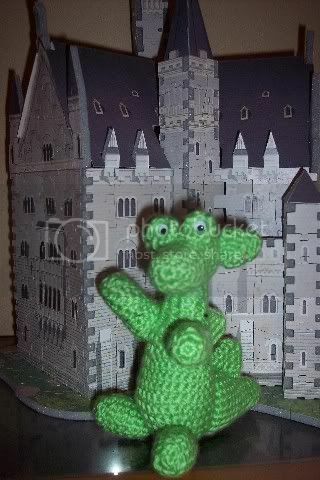 Second, AWESOME dragon, I can totally understand why your daughter loved getting this for her birthday! Great job!!! Hi and welcome, There are a lot of men who crochet, . My husband liked to do the tapestry afghans, before I taught him that, he wouldnt pick up a needle. Nothing wrong with showing some team pride (even if its for the wrong team lol ) When i first learned I was too impatient with myself and was a chain-a-holic for a long time. Had chains all over the house for ever holiday and just because I got over it and so will she Welcome to crochetville ! old thread... joined in 2007!! would love to see more hooking projects though! Welcome from Central Iowa! I think crochet is great fun, no matter your gender. I do wish there were more men around here though. The booties sound like great fun. And the dragon is a DOLL! I bet your daughter is thrilled with him!